Since ancient Times, the Port of Kobe has been a center for communication and trade with ports on the Chinese continent and the Korean peninsula. Under the policy of national isolation from 1641 to 1853, the Port of Kobe played a significant role as a key center of domestic transportation. 143 years ago, on January 1, 1868, the Port of Kobe opened to the world. In subsequent years the port actively expanded and improved its facilities, evolving into one of the worlds leading ports. Due to the disaster of the Great Hanshin-Awaji earthquake in 1995 the port suffered heavy damage, but was restored in only two years thanks to all-out efforts of the organizations concerned. Recently the Port, being an attractive destination as a gateway to locations such as Kyoto, Nara and Seto Inland Sea, has placed a high priority on attracting cruise ships, and equipped a second cruise terminal with CIQ facilities and a boarding bridge in January 2006. The Port has also opened a domestic airport and started an access service to Kansai International Airport by high-speed boat. This improved access will give the Port of Kobe an advantage as a turn-round port for cruise ships. Kobe is one of the most beautiful ports in the world, with the lush green backdrop of the Rokko Mountains, and its deep water and mild climate throughout the year. The Port of Kobe is an attractive destination as a gateway to the World Heritage Sities such as Kyoto, Nara and Himeji Castle and the scenic Seto Inland Sea cruises. 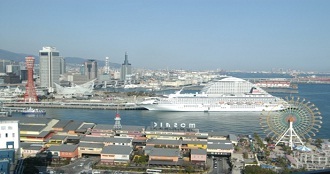 The Port of Kobe has two cruise terminals, “Kobe Port Terminal”, and “Naka-pier Cruise Terminal”. Both terminals are located close to the downtown with excellent transit access, and equipped with fully-featured CIQ facilities and passenger's boarding bridges. 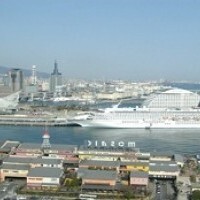 The Port of Kobe has a superb access to Kobe Airport and also to Kansai International Airport by high-speed boat. Thus the Port keeps on growing into an ideal base port for "Fly & Cruises".